This chapter is a synthesis of new knowledge, procedures, best practices and references for collecting plant diversity since the publication of the 1995 volume Collecting Plant Diversity; Technical Guidelines, edited by Luigi Guarino, V. Ramanatha Rao and Robert Reid, and published by CAB International on behalf of the International Plant Genetic Resources Institute (IPGRI) (now Bioversity International), the Food and Agriculture Organization of the United Nations (FAO), the World Conservation Union (IUCN) and the United Nations Environment Programme (UNEP). The original text for Chapter 19: Gathering and Recording Data in the Field, authored by H. Moss and L. Guarino, has been made available online courtesy of CABI. The 2011 update of the Technical Guidelines, edited by L. Guarino, V. Ramanatha Rao and E. Goldberg, has been made available courtesy of Bioversity International. 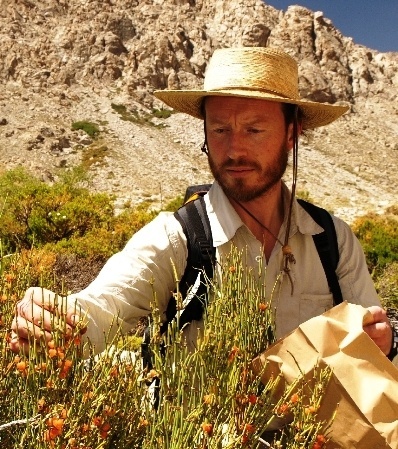 Michael Way, of Kew, collecting Ephedra andina for the Millennium Seed Bank. . While the medium for data recording in the field remains paper forms and notebooks for many genetic resource conservation programmes, the direct capture of geolocation, image and associated data in digital form is increasingly practiced. Portable computers have proven utility for recording field data. They can be preloaded with standardized descriptor lists for a project or mission, enabling swift output of data for checking and uploading to the main project database. This allows for greater standardization, accuracy and completeness of data, as well as potential time savings. For many genetic resource conservation programmes, the medium for data recording in the field remains paper forms and notebooks because of their inherent reliability and flexibility, but the direct capture of geolocation, images and associated data in digital form is increasingly practiced worldwide. Portable computers now have proven utility for recording field data, and when used to full potential, they can be preloaded with standardized descriptor lists for a project or mission, enabling swift output of data for checking and uploading to the main project database. This allows for greater standardization, accuracy and completeness of data, as well as potential time savings. Field laptops (specified for their resilience in field conditions) have been useful for data capture in the United States Seeds of Success programme (Byrne and Gordon 2009) when preloaded with collectors’ software developed by BG-BASE, Inc. but the sensitivity of laptops to dust and moisture, together with limited battery life, has limited their use for prolonged fieldwork. More promising has been the use of compact hand-held computers (notably the Portable Data Assistant, PDA). The team from the Embrapa-Cenargen Herbarium in Brazil have used the Newton screen with Elcen software to facilitate the collection and transfer of standardized data from multiple herbarium specimens at a single location (Cavalcanti et al. 1998). In projects compiling data for the United Kingdom Overseas Territories Species and Specimens Database (http://dps.plants.ox.ac.uk/bol/UKOT) a more comprehensive database with extensive dictionaries for vegetation type, threat and habitat characteristics has been loaded into PDAs that include an integrated global positioning system (GPS). In bad weather these devices have been used within protective covers, but the speed of development of PDAs will bring increasingly robust and powerful tools into the market, which can be of practical use for germplasm collecting teams. The most significant obstacle to wider use (the limited battery life of this equipment) can be overcome either by carrying flexible photovoltaic panels that can be deployed at the collection site or by fitting solar panels to the roof of the expedition vehicle for periodic recharging of equipment batteries. Advice on the options available is set out in chapter 13 of the Field Techniques Manual of the Royal Geographical Society (McWilliam et al. 2005). Byrne M, Gordon P. 2009. Seeds of Success: Using technology to help build a national collection of native seed. Public Garden 24(3):21–22. Available online (accessed 3 October 2011): www.nps.gov/plants/sos/news/Byrne%20and%20Gordon,%20Public%20Garden,%20vol24%20no%203.pdf. Cavalcanti TB, Rezende A, Togawa R, Rodrigues P, Favilla LM, Neshich G. 1998. A new field-tested electronic system for gathering, recording, transfer and dissemination via the world wide web. Taxon 47(2):381–386. Available online (accessed 3 October 2011): www.cbi.cnptia.embrapa.br/~neshich/PDFs%20GN/7.8.pdf. McWilliam N, Teeuw R, Whiteside M, Zukowskyj P. 2005. Field Techniques Manual: GIS, GPS and Remote Sensing. Royal Geographical Society, London. Available online (accessed 3 October 2011): www.rgs.org/NR/rdonlyres/8B549B39-9F2E-4D3B-B856-8A100AE2CCC2/0/Chapter13FieldEquipment.pdf.